Resortin de Profeta is the first born son of the exciting black fino mare La Resortina del Classico, and his sire is the legendary Profeta de Besilu. 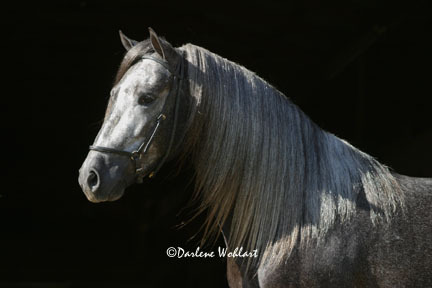 Resortina’s dam is Pianola, an own daughter of Resorte IV and her sire is the incomparable El Classico de Plebeyo. Resortina is an exceptional Classic Fino mare who competed both regionally and nationally and who won most of the classes she entered. Resortina is admired by many for her beauty as well as her quick collected Fino gait. As a three year old colt, Resortin de Profeta was shown lightly and he won 1st Place Classic Fino Schooling Colt 3 Y/O class at the 2005 pre-Spectrum show – his very first time in the show ring! 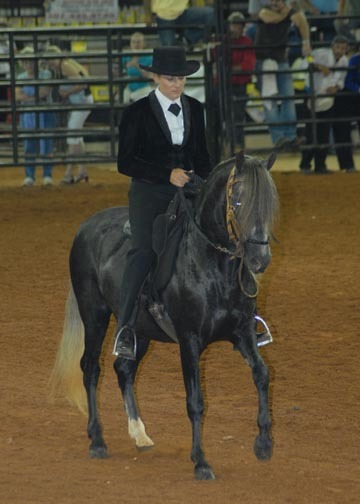 At the 2005 Extravaganza Resortin was awarded second place in the three year old classic fino schooling class. 2006: Spectrum - 2nd Place Classic Fino Schooling Colt 4 Y/O. 2007: Fla PFHA Miami International 3/17/07 1st Place Classic Fino Stallions; Champion Classic Fino Stallion. Owned by Maria Bonita Paso Finos.